I’ll admit it: I had pretty low expectations going into The Doyle and Debbie Show. The only thing that convinced me to check it out was the insistent Katy Walsh of Chicago Now’s The Fourth Walsh. “You’ll love it,” she told me over drinks last week. I mean, a comedy show about a washed up country and western duo? This is *so* not my thing. Well, I haven’t laughed so hard in the theatre in, gosh, I can’t remember how long. Even more importantly, it’s been ages since I’ve witnessed an audience (a very full audience on a Tuesday night, by the way, which is very rare) genuinely enjoy themselves so much. (Seriously: the woman behind me I think nearly had an aneurysm from LOLing at one point.) Thank you for the recommendation, Katy! What makes this 90-minute show such a great time? I think it’s a combination of many things. First you have the premise: Doyle, a once popular C&W singer/songwriter has come back from a 30-year hiatus involving alcoholism, four wives and some sort of vague mental breakdown. 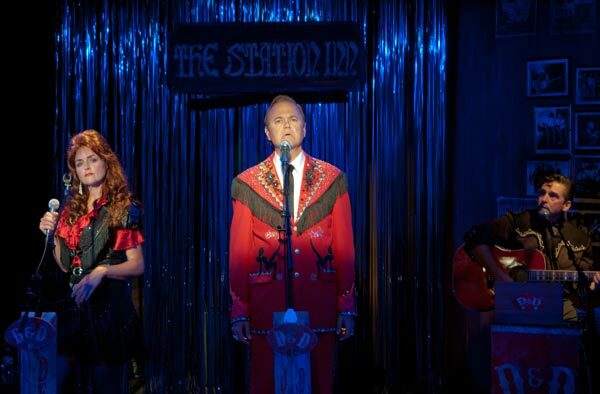 Tonight is Doyle’s big Nashville return, and he’s brought along with him his famous other half, Debbie. Well, she’s not the Debbie we’re used to, because she’s the “new” Debbie, a single mom whom Doyle discovered only six weeks ago singing her heart out at the VFW hall. Eager for her big break, “Debbie” has learned all the songs and performs them with utmost conviction, while desperately trying to keep the show afloat as Doyle falls apart onstage. And then there’s the cast: Arntson and Littleton have been playing these roles since they created the cultishly popular show in 2006 in Nashville, and you can tell they know exactly who Doyle and “Debbie” are. They aren’t just great singers (Arntson is an expert yodeler and Littleton’s powerhouse voice easily slips between Dolly Parton twang to Patsy Cline crooning) but also expert performers. Particularly Arntson, who has the energy of a herd of feral horses and the uncanny ability to both charm and repulse you. The Royal George’s casual cabaret space is the perfect venue for this surprising little show. Take your friends and your cowboy boots — you’ll have a great time. I promise.